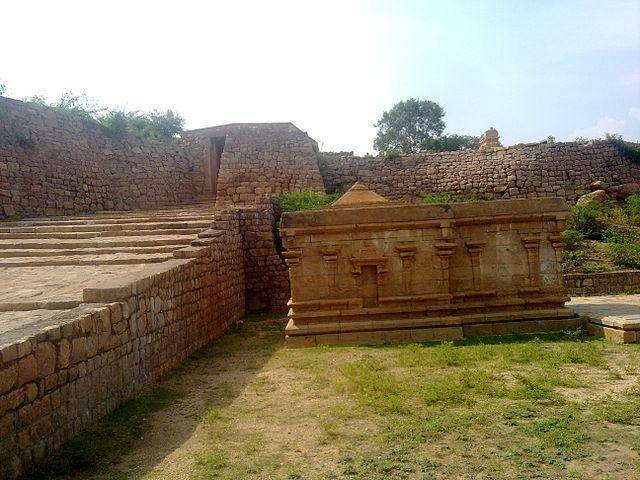 Sankagiri Fort was bult in 15th century by the Vijayanagara Empire. Tourists can see nearly 14 fort walls were built across the Sankagiri Hill. British built the last fort wall. It served as an army base for Tippu Sultan before being captured by British. British used this fort for securing the money and gold collected as Tax from various Kingdoms of Kongu Nadu (Salem, Erode, Nammakkal, Karur and Dindukal). The fort is well secured as it can be accessed through from only one side of hill whereas other sides are very steep slope to climb. There are a Death Well, Hayloft, two Oil Warehouse, one explosive store house etc. Tourists can see a Long cave with a Masjid as its entrance. Cemeteries for British and Muslim Army officials can be founded within the fort. Tourists can worship Varadaraja Perumal Temple which is located inside the Fort. Dheeran Chinna Malai, a 17th century intrepid warrior and Kongu Nadu Chieftain, who beheaded Colonel Maxwell (Colonel who was powerful enough to defeat Tippu Sultan), was hanged to death by British in this Fort.